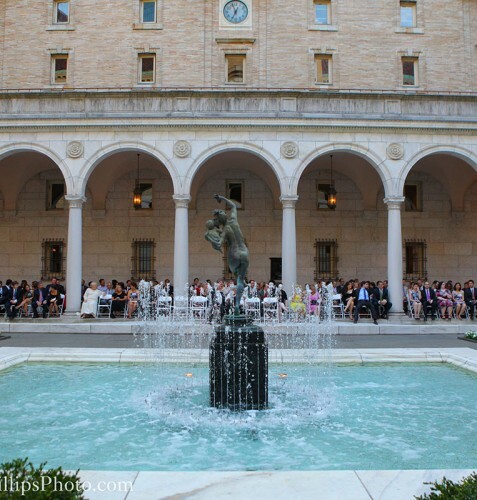 The Catered Affair at the Boston Public Library is excited to highlight the library in all its beauty with a week dedicated to its many rooms and spaces. Join us as we journey through the library and devour all that it has in store. 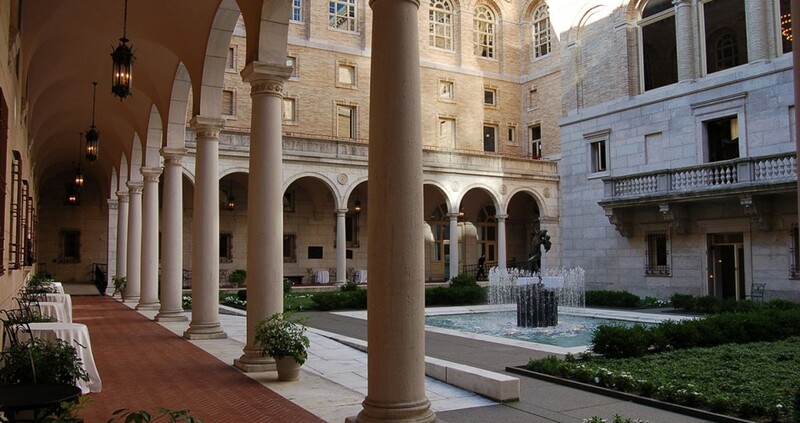 The Courtyard at the Boston Public Library is the perfect oasis in the hub of Boston’s Copley Square. Blooming with fresh florals and lush greenery, the interior courtyard in the McKim Building will impress you and your guests from the moment you see its beauty. During the day, the courtyard is a relaxing spot to work or dine on dishes from the Map Room Café, but after hours it transforms into a venue blushing with charm and intrigue. 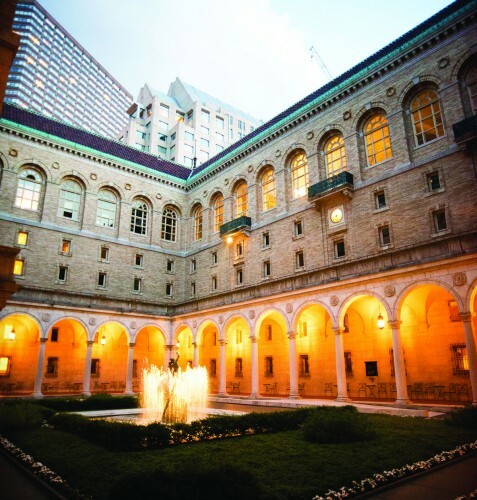 The Courtyard at the Boston Public Library is the perfect oasis in the hub of Boston’s Copley Square. Blooming with fresh florals and lush greenery, the interior courtyard in the McKim Building will impress you and your guests from the moment you see its beauty. During the day, the courtyard is a relaxing spot to work or dine on dishes from the Map Room Café, but after hours it transforms into a venue blushing with charm and intrigue. 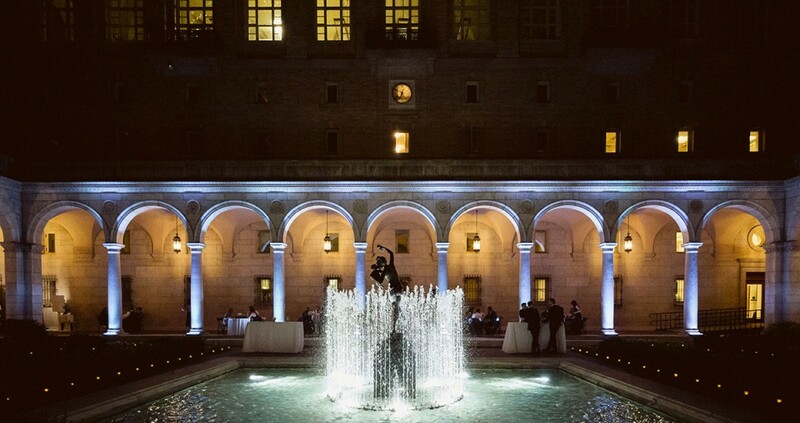 Whether you’re impressing clients and employees at a corporate gala or hosting your wedding ceremony amongst its grandeur, the interior courtyard in the McKim Building is one of our favorite spots in the library. 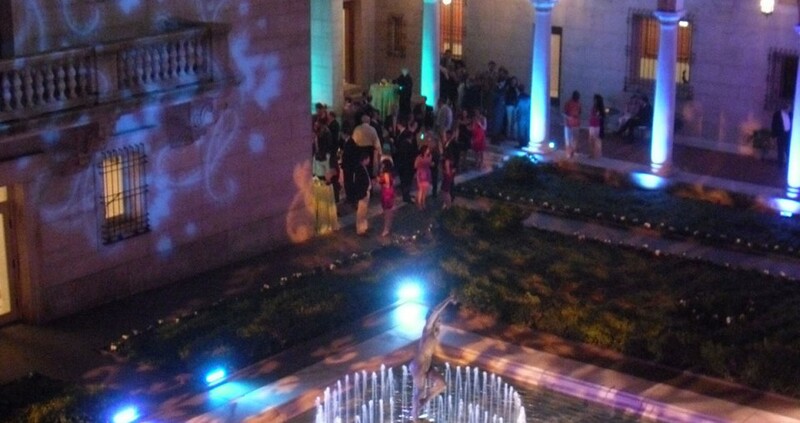 Hosting up to 225 standing guests or 75 seated, the courtyard is as versatile as it is beautiful. 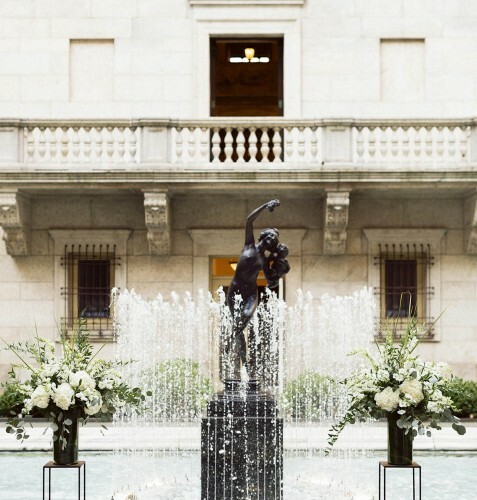 Plan a fun cocktail reception with an outdoor bar or build out your dream wedding ceremony in front of the ornate fountain. 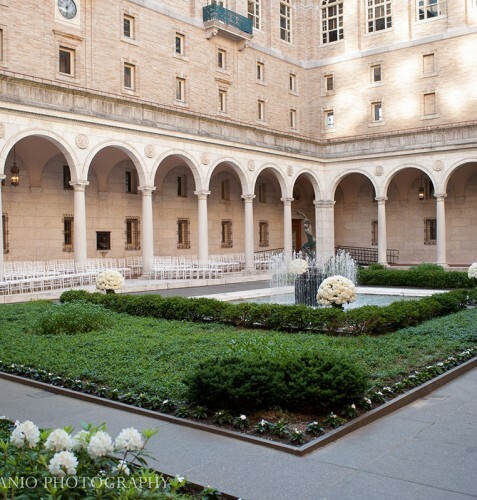 Beyond its innate beauty, the courtyard is filled with history and timeless art and culture. 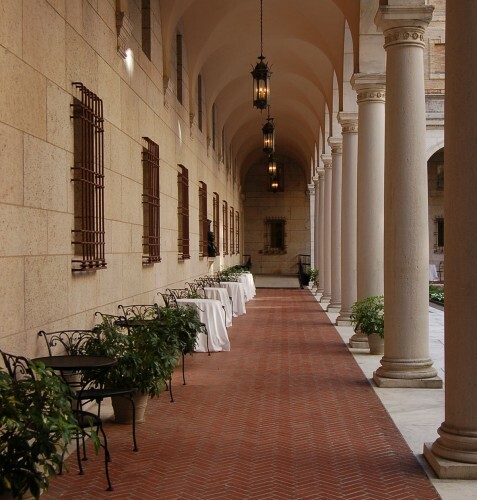 Enjoy a taste of Rome in Boston as you explore the arcaded promenade, an almost-exact facsimile of the arcade of the Cancellaria Palace in Rome. Or, gaze on the Bacchanate, the ornate statue in the middle of the fountain, or enjoy the intricate details along each column. 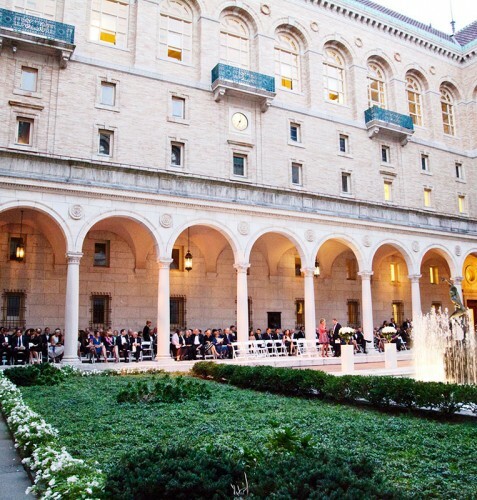 For a wedding ceremony, seated dinner, or cocktail reception, the courtyard is a haven of beauty and peace rarely found in a public space and can be uniquely tailored to your event. Our tip? For your wedding ceremony, build your menu with fun stations like a raw bar or a macaroni and cheese bar. Then, place them around the courtyard in different spots and allow guests to easily mingle throughout your cocktail reception.